Permsiri. A quiet secure village just on the outskirts of the City centre. 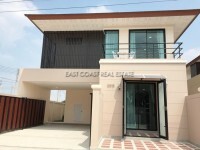 This house being just 1km away from the Sukhumvit Highway allows for easy access to and from all locations throughout Pattaya City. The stunning villa has received many upgrades over the years by the owner, from fitted European kitchen, private swimming pool, large outdoor patio, and en-suite bathrooms with the master bedroom having a Jacuzzi tub. This house really needs viewing to understand how much detail this home has. The title deed is held in a Thai company, so transfer fees are minimal.